Do You Feel Empowered to Create a Great Life? Do your friends, co-workers, neighbors? When I was earning my practitioners license from the Centers for Spiritual Living back in the late ‘90s I would drive home through the peaceful, expansive high desert of Nevada reflecting on all I was learning about the co-creative nature of reality and personal consciousness and responsibility. We were reading the classic writings of Ernest Holmes, Thomas Troward and others, and learning how to consciously move positive energy in our lives with our thoughts, prayers and consciousness. I would leave class filled with a sense of possibility about all I wanted to create and experience in my life. The beauty and expanse of the scenery driving home supported the beauty and expanse of the concepts I was immersing myself in. I was grateful to have found the tools to make my life the best it could possibly be. It felt like I was receiving divine answers - like there was a rhyme and a reason for why life unfolds the way that it does. We then moved to Massachusetts and I entered graduate school for psychology and expressive therapies. As I immersed myself in this more ‘traditional’ curriculum, I found myself regularly wondering, “Why aren’t more people jumping on the personal empowerment bandwagon and taking control of their own destiny?” Why aren’t they adopting the idea that we each create our own experiences? Then one day in our Culture and Identity Class – a course designed to ensure we were skilled to navigate different cultural mindsets - our professor offered us an insightful framework. This framework spoke to worldview and how a person has been conditioned to perceive their ability to effect change in their own lives. This framework seemed to offer inspired answers to my question about why we don’t all think in empowering ways. I am grateful to psychologist Derald Wing Sue (1978) whose theory depicts four possible core worldviews that define a person’s sense of responsibility and control over his or her circumstances. 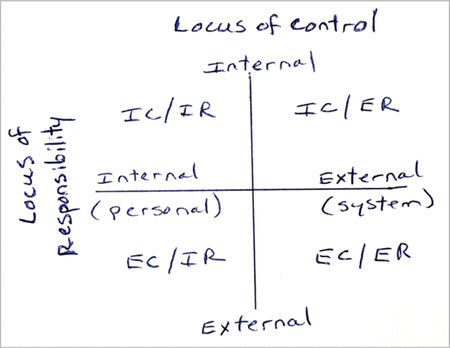 In defining these, Mr. Wing Sue uses the terms Internal or External Locus of Control and Internal or External Locus of Responsibility. In other words, respectively, a person’s perception regarding how much control he or she has to change things and one’s perception as to how much responsibility is his or hers to assume in how things turn out. The combinations of these represent the four possible worldviews. This simple but powerful model shows us that a person’s worldview greatly influences his or her sense of power and control which determines what he or she feels entitled to create and receive, feels able to give, and it influences one’s ability to take responsibility for his or her own life. Can you see how beautifully this framework addresses the question, why doesn’t everyone feel empowered to effect change in their life? Where does your thinking fall in this model? Do you have one worldview in one area of life (e.g. work) and a different approach in another (e.g. relationships)? Does this help you understand why others may think differently than you or shed light on why others don’t take the bull by the horns in certain areas of their life? It really helped me. Information changes things and that’s why I offer this framework for your consideration. Sitting in class that day in Cambridge, MA wasn’t the same expansive environment of driving home in the wide-open mountains of the high dessert, although it was for my mind. It gave me understanding. True, I love my empowering philosophy but I love acceptance, understanding and inclusivity just as much. Please also see my other article on page 17 about Young Living’s Essential oil blend called Acceptance, which can help us all in this journey. *Credit goes to: Derald Wing Sue. (1978) Eliminating Cultural Oppression in Counseling Toward a General Theory. perception one pattern at a time through her guided writing process and energy clearing work.